Streamlined Supply Chain Management: 1 P/N, one supplier. Consolidates all quality control with one entity. 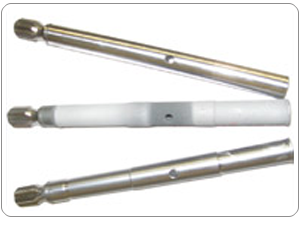 This Actuator Shaft has coated Bushing Surfaces for enhanced wear resistance at high temperatures. We MACHINE the basic shaft, subcontract ion NITRIDING, HVOF COAT, and finish GRIND this shaft in high volumes to meet a weekly demand schedule. 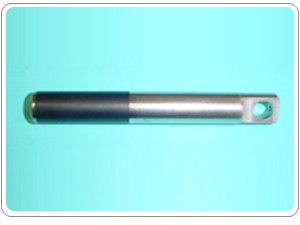 Here is a photo of a Pump Plunger Rod with a Ceramic Seal Area, supplied complete: MACHINED, COATED, GROUND and LAPPED and shipped to meet a JIT Demand Schedule monitored weekly. Subcontracting a basic part from a customer designated supplier of castings, assemblies, stampings, or for a complementary surface treatment. ROBOTIC application of thermal sprayed coatings. At PCI the focus is product performance. The success of each customer’s project is important to us. We offer solutions and work with you every step of the way. From the initial engineering sessions to the final evaluation of “in- use” performance, you can count on us. We are ISO 9001 Registered, reflecting our commitment to continuous improvement in our operations. Each day the company strives to engineer and produce coatings that meet industry and customer needs of today and the future.